People abstain from food and in some cases, liquid during a fast. Fasts take many forms and you should use caution what type of Fasting Diet you follow. It has many benefits if done in a responsible and controlled manner. People fast for several reasons such as for religious purposes, to drop weight, get rid of toxins or to increase health. Don’t use a Fasting Diet to lose weight rapidly since you will gain even more weight afterwards. It helps the body to get rid of toxins, dead body cells and increases the healthy state of mind, and to reduce cholesterol levels. In order to reap these benefits, a person should take supplements during the fast. A moderate fast with fruit and juice is recommended rather than a full fast. Who should avoid a Fasting Diet? It is dangerous to people with chronic diseases, pregnant or breastfeeding woman, people with cancer, diabetes, gout, hypoglycemia, ulcers, liver or pancreas diseases, and those with lung problems. All persons who have a deficiency in their immune system should avoid fasting. The body can take a 24-hour fast without any harmful effects. Longer periods of fasting may result in muscle tissue loss. The body will first store fat since it experiences the fast as a famine and saves everything it gets. After the glycogen resources are depleted, it will start to use the fat resources. The muscle tissue is still spared until all the fat resources are used, but some muscle tissue loss will take place after a period of fasting. A person may experience weakness, fatigue, headaches, nausea and even depression, because ammonia and nitrogen are released into the blood when muscle tissue gets used. Ketone, which is a byproduct of the fat metabolism, is released into the urine and it places extra strain on the kidneys to get rid of it. Long fasts may disturb the heart rhythm and may even lead to death. Don’t start a fast just before a wedding or a birthday party. It will be pure agony. You should also not start a fast when you are sick since your body will need nutrients to fight the disease. Prepare the body with a raw food diet and juice to minimize shock on the system. It also acts as neutralizing and purifying agents to cleanse the blood. Your system is now prepared for aperiod of no-food. 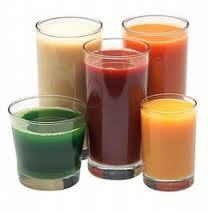 Fruit juice helps to neutralize negative pathogenic substances. It also acts as a tonic with vitamins to sustain vital body functions. Never drink fruit juice undiluted. It will stimulate the digestive system during the fast. Avoid ice in juice and water during this period. Dilute the juice of half a melon or orange to one glass of water. No food intake but plenty of water to dilute pathogenic materials and assist the body to eliminate it through the skin. No food or liquid intake for a short period. It is dangerous to use this method for more than one day. It is however a good method to get rid of all dead matter in the body. It stretches over seven consecutive days and is one of the safest fasting methods. This type of fast stretches over seven days up to 40 days. It is potentially harmful and should be done under medical observation. It is dangerous to just follow a normal diet after a prolonged fast. The longer the fast, the more care you should take when breaking it. You can destroy the beneficial effects of the fast if you don’t follow the correct procedure. You may be so hungry that you eat too much over a short period and this is harmful to your body. Introduce a small quantity of food at a time to avoid an overload on the inactive digestion system. You can break the fast with a few tablespoons of unsalted popcorn. You can follow it up within an hour with a glass of mild fruit juice. You can take three glasses of mild fruit juice on the second day. By the third day, take fruits together with the juice. You can eat raw vegetables and food on the fourth day and gradually introduce a normal diet thereafter. Consider both the benefits and the side effects before you follow a Fasting Diet. Take supplements and introduce the fast over a period. Consult a dietician before you embark on a fast and take care in how you break the fast in order to reap the most benefits from the fast.